The secret Romulan/Cardassian fleet enters the Gamma Quadrant hell-bent on taking out the Founders, and Garak is forced to interrogate Odo to find out what he knows about them. The scene where the ships decloak on their way to the wormhole and utterly ignore the station is just flat-out awesome. This episode feels so big and epic and draws from so many different major dangling plot threads that you almost expect it to be the end of the season. Odo reaching for the camera while he tries to morph is some nice cinematography. 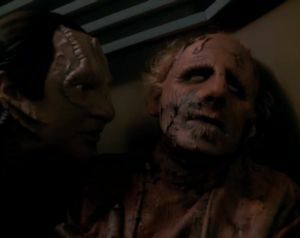 Man, Odo looks like a freaking zombie. There are many subtle parallels to Shakespeare's Julius Caesar, which of course was explicitly mentioned at the start of "Improbable Cause." Garak quotes it, and the tragic fall of Tain to his own vanity and self-confidence is similar to the fall of Caesar. Granted, it's not a perfect parallel, but it's a good one nonetheless. Why is the Dominion attacking Odo's runabout? Don't they know Odo's on board? This episode sets a new tone for space combat in Star Trek, with more fast-paced, intense action than ever before. The way the Dominion so effectively wipes out the Tal Shiar and the Obsidian Order in one fell swoop is a great way to make them terrifying. They just checkmated the two best chess players in the Star Trek universe, and then threatened to deal with the Klingons and Federation to boot. Wow, that's some great foreshadowing. Garak complains to Bashir at the start of "Improbable Cause" that humans eat too quickly and don't spend enough time talking--a sentiment that Bashir reinforces with O'Brien later when O'Brien doesn't want to eat and talk at the same time--and then, at the end of this episode, Odo tells Garak that he wants to have breakfast sometime, even though he doesn't eat at all. Nice writing. I have so many great things to say about this two-part episode, I hardly know where to begin. Season 3 feels like it's been dragging its feet since the reveal of the Dominion that started it out. This story, however, draws from all the best things the season has going for it and mixes them into a huge event that is both staggeringly important for the mythology of the show but also deeply personal. The interrogation of Odo is short, but gut-wrenching, and the reveal that a Changeling has infiltrated the Tal Shiar (and that the Changelings are perfectly capable of taking on the appearance of actual, solid people) should set off major alarms throughout the Alpha Quadrant. If this is the direction the show is going to continue going in, I'd better strap myself in. We eventually learn, in "In Purgatory's Shadow," that Enabran Tain is taken prisoner by the Dominion during the final moments of this episode.